Well, I guess I’m kind of on an Adirondack chair kick. This is my second set within a month. This set was a much faster build, now that I have a better idea of what I’m doing and have made templates. Also, I made a jig to cut the back slats on the table saw. Overall, cut about 30% off my first build time. Great looking Adirondacks! Now all you need is a side table, and a couple of cold ones, and you’re all set! Dean – thanks, and I completely agree with you. A side table and cold ones are on the list. Great build! 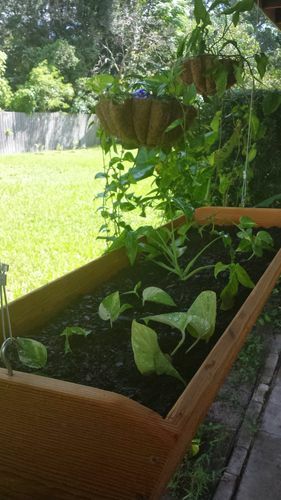 Nice touch adding your planter to the pics too. Need some plants in there! Thewoodman2000 – you made a valid point, and motivated me; thank you!. This pic is for you.